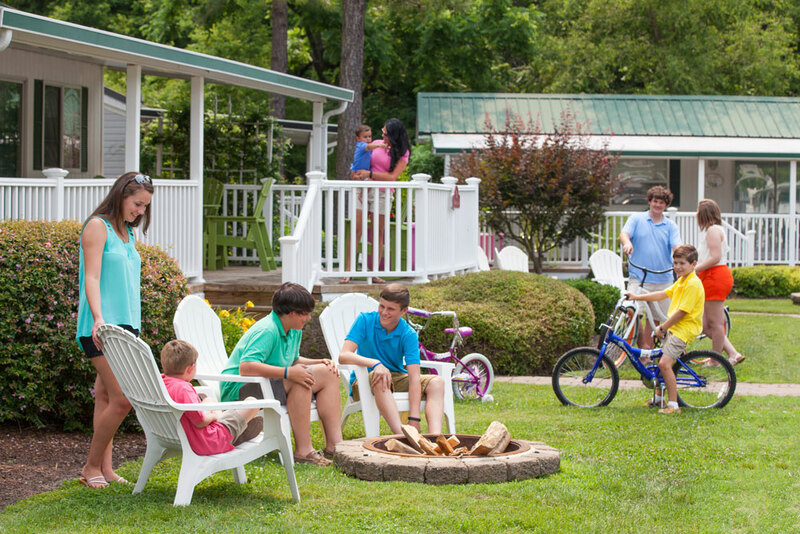 You’ve always wanted to visit Bethpage Camp-Resort but you don’t own an RV. 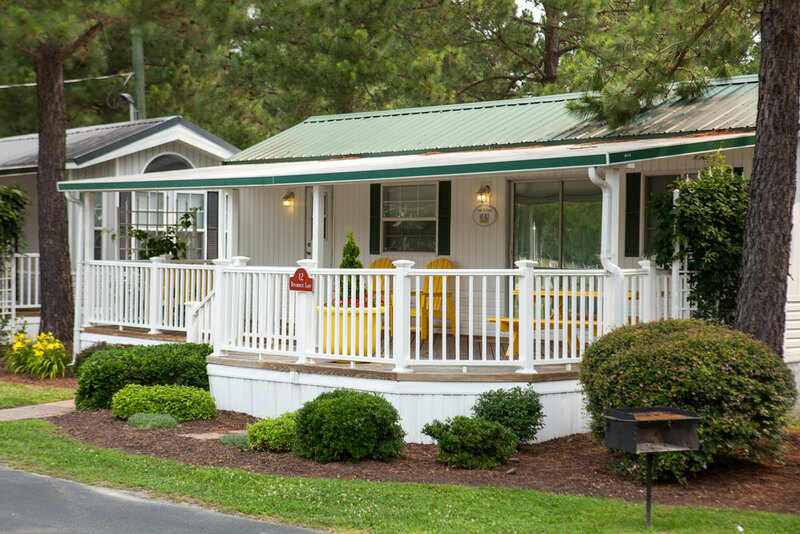 Now you can rent one of our beautifully appointed cottages and enjoy all the same amenities Bethpage Camp-Resort has to offer! Our cottage rentals in Virginia come in one, two and three bedroom models to fit the needs of any family. These vacation homes include our attention to every detail! Prepare fresh seafood from the local market in your fully-stocked kitchen. Kick back and relax on the roomy front porch in the Adirondack chairs. Roast marshmallows with the kids in the fire pit outside! Grill up today’s catch on the outdoor grill and dine under the stars. It’s the perfect place to reconnect with your family and have an amazing vacation! Cottages are great for reunions, retreats and other groups looking to spend a little time together. Click for Cottage rental rates. Click here or the floor plan to view a larger version. All cottages have one pull out sofa. Bunk beds have maximum weight limits and are suitable for children. Our vacation cottages are located on Riverbirch Lane, River Run, and Hewick View Lane. Each model has cathedral ceilings, ceiling fans, lots of windows and a warm inviting feeling. The cottages have a fully equipped eat-in kitchen, color TV with cable, high speed internet connection and central heat and air conditioning. With a spacious deck, picnic table, chairs and an outdoor grill, you can expand your party outside to fully enjoy the warm days and evening breezes in “Rivah” country. Each model has cathedral ceilings, ceiling fans, lots of windows and a warm inviting feeling. Hewick View Vacation Rentals overlook historic Hewick Plantation. The two bedroom 1 & 1/2 bath park model has a queen size bed in the master bedroom. The second bedroom has a full size bed and a half bath. There is even a full size sofa bed that brings the total number of guests that the 2 bedroom vacation rental can accommodate to 6. Floor plan here. 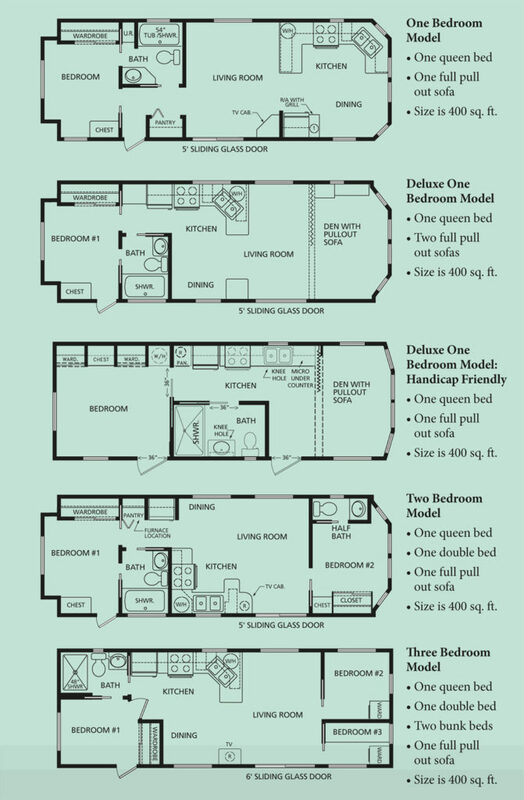 The handicap friendly, deluxe one bedroom park model has a queen size bed in the master bedroom. The den has one full pullout sofa. There is an undercounter microwave and knee holes in the kitchen and bathroom. The door ways are extra wide–36″. Floor plan here. The three bedroom park model has a queen size bed in the master bedroom and a full size bed in the second bedroom and a full size sleeper sofa also. The third bedroom has twin bunk beds for the younger campers in your family enabling 8 guests to vacation comfortably. Floor plan here. All Vacation Cottages have a fully equipped eat-in kitchen, color TV with cable, high speed internet connection and central heat and air conditioning. With a spacious deck, picnic table, chairs and an outdoor grill, you can expand your party outside to fully enjoy the warm days and evening breezes in “Rivah” country. There are even full-hookup campsites right next to the rentals so everyone can vacation the way they want to, camping or renting, and still be together. Though we want you to make yourselves at home, we prohibit smoking and pets in the vacation rentals. Read our complete policies and procedures.